Taxes may be due in just a few weeks, but many taxpayers can still trim their 2016 tax bill and increase their long-term financial security at the same time. That’s because tax-deductible contributions to an Individual Retirement Account made up to the tax deadline count toward last year’s taxes. Most Americans don’t take advantages of the accounts, though. Fewer than a third of Americans have an IRA, according to a new report from TIAA, and just 19 percent actively contribute to one. Nearly half of Americans say that they don’t contribute because they don’t have the extra cash, but it appears that some avoid IRAs because they don’t understand them. 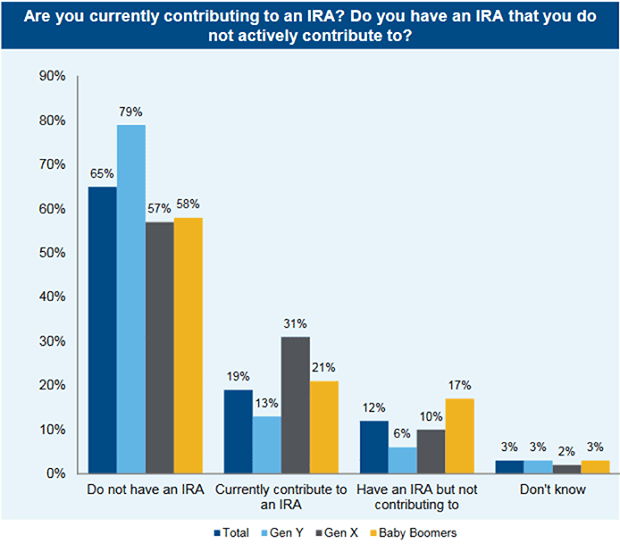 The report found that 28 percent of those without an IRA said that they don’t know enough about them to invest in one, and 17 percent said they were too complicated. IRAs are a relatively straightforward product. You can set one up with just about any bank, brokerage or mutual fund company, and in 2015 younger savers can put aside $5,500 a year, while those over 50 can save $6,500. If you don’t have access to a workplace retirement plan, contributions to a traditional IRA are deductible. If you do have a 401(k), IRA contributions begin to phase out for individuals making between $61,000 and $71,000 and for couples making between $98,000 and $118,000.